There’s never been a better time for health professionals in today’s world, and we know you want to set yourself apart. Approach health holistically by studying in a program that combines the interrelated fields of exercise science and nutrition. Gain expertise on how the body moves, functions and is fueled. Explore how to improve quality of life and performance for a variety of populations. Learn from our passionate and experienced faculty, surrounded by our state-of-the-art equipment and facilities. Go on from here to have a lasting impact through a degree that is uniquely designed to accommodate your interests and abilities. Let us empower you— so that you can empower your community. This framework allows for maximum flexibility, allowing students to forge their own unique path in preparing for their career aspirations. The following areas of emphasis are available based on your selection of elective courses. Townsend J.R. and others. Influence of Baseline Muscle Strength and Size Measures on Training Adaptations in Resistance-Trained Men. International Journal of Exercise Science. 2018; 11(4), 198. Townsend J.R. and others. Polyphenol Supplementation Alters Intramuscular Apoptotic Signaling Following Acute Resistance Exercise. Physiological Reports. 2018; 20186(2). Townsend J.R. and others. Resistance Exercise Elicits a Selective Mobilization of Monocyte Subsets: Effects of Polyphenol Supplementation. Medicine and Science in Sport and Exercise. 50(11), 2231-2241. Townsend J.R. and others Resistance training does not induce uniform adaptations to quadriceps muscles. PLOS ONE. 2018. 13(8), e0198304. Toohey J.C., Townsend J.R., Bender D., Johnson, S.B., Ruiz M.D., Toy A.M., Vantrease W.C. and others. The Effects of Probiotic (bacillus subtilis) Supplementation during Offseason Resistance Training in Female Division I Athletes. The Journal of Strength and Conditioning Research. 2018. Bender D., Townsend J.R., Heffington S.H., Henry R.N., Johnson K.D., Marshall A.C. and Vantrease W.C. Acute Beetroot Juice Administration Improves Peak Isometric Force Production in Adolescent Males. Applied Physiology, Nutrition, and Metabolism. 2018. Sapp P.A., Townsend J.R., Johnson K.D., Marshall A.C. and Vantrease W.C. The Effects of Dietary Manipulations on Ultrasound Assessment of Muscle Size and Quality. Journal of Exercise and Nutrition. 2018. Townsend J.R., Bender D., Vantrease W.C., Toy A.M., and Johnson K.D. Effects of Probiotic (Bacillus subtilis DE111) Supplementation on Immune Function, Hormonal Status and Physical Performance in Division I Baseball Players. Sports. 2018; 6(3), 70. Partida S., Marshall A.C., Henry R.N., Townsend J.R., and Toy A.M. Attitudes toward Nutrition and Dietary Habits and Effectiveness of Nutrition Education in Active Adolescents in a Private School Setting: A Pilot Study. Nutrients. 2018; 10(9), 1260. Ruiz, M. D. (2017). A psychotheology of losing. Journal of the Christian Society for Kinesiology, Leisure & Sport Studies, 4, 47-64. Vantrease W.C., Bender D., Johnson K.D. How Does Air Displacement Plethysmography and Direct Segmental Bioelectrical Impedance Compare in a University Student Population? 2018 Southeast ACSM Annual Conference. Chattanooga, Tennessee. Sapp P.A., Townsend J.R., Marshall A.C., Johnson K.D., Vantrease W.C. The effect of dietary manipulations on ultrasonography derived measures of muscle architecture. 2018 SEACSM Annual Conference Chattanooga, Tennessee. Partida S., Marshall A.C., Henry R.N., Toy A.M, Townsend J.R. Comparison of nutrition intervention techniques and their effectiveness on active high school and middle school students in a private school setting. 2018 SCAN Conference. Denver, CO.
Townsend J.R., Bender D, Vantrease W.C., Sapp P.A., Toy A.M., Woods C., Johnson K.D. The effect of probiotic supplementation on markers of immune and endocrine status in Division I baseball players. 2018 ISSN Conference, Clearwater, FL. Johnson K.D., Vantrease W.C. Does a Push-Up Using the Spyder 360 ™ Elicit More Muscle Activation Compared with a Standard Pushup? 2018 ACSM Annual Conference Minneapolis, MN. Partida S., Marshall A.C., Henry R.N. Attitude toward nutrition, dietary habits and nutrition knowledge of active adolescents in a private school setting. American Society for Nutrition Annual Conference 2018. Ruiz, M. D. (2018). A conversation on race, religion, and college sports: Lessons from a university's recent dilemma. In Effects of Religiousness and Spirituality in High Pressure Contexts – Poverty, Prejudice, and Performance Symposium. Conference proceedings of the 2018 American Psychological Association Convention, San Francisco, CA. Ruiz, M. D. & Henry, R. (2018). The relationship between body composition, body image, and attitudes towards obesity. Conference proceedings of the 2018 Christian Society for Kinesiology, Leisure and Sports Studies Annual Conference, Grand Rapids, MI. Ruiz, M. D., Robichaud, K., & Townsend, J. (2017). The differences in attitudes towards obesity between Christian teenagers and Christian adults. Conference proceedings of the 2017 Christian Society for Kinesiology, Leisure and Sports Studies Annual Conference, Nashville, TN. Ruiz, M. D. (2016). A psychotheology of losing. Conference proceedings of the Inaugural Global Congress on Christianity & Sport, York, United Kingdom. Egli, T. & Ruiz, M. D. (2016). Integrating Christianity into the sport psychology classroom: Practical applications. Conference proceedings of the 2016 Christian Society for Kinesiology & Leisure Studies Annual Conference, Santa Barbara, CA. Ruiz, M. D. & Egli, T. (2016). Expectations and Christian-athletes: What happens when our favorite Bible verses work against us? Conference proceedings of the 2016 Christian Society for Kinesiology & Leisure Studies Annual Conference, Santa Barbara, CA. Deerland Enzymes Inc. awarded Dr. Jeremy Townsend a grant for “The Effect of ProHydrolase® on the Amino Acid, Intramuscular Anabolic Signaling, and Endocrine Response to Resistance Exercise in Trained Males”. Our EXNS program is housed in the newly renovated Hughes Center and features 5 state-of-the-art lab spaces to take your learning to the next level. Get your training on premier equipment like the DEXA and in the brand new hyperbaric chamber. Spend time learning everything from force-plate analysis to muscle biopsy research in the Human Performance Lab. Additional resource spaces include a Foods Lab and Gross Anatomy Lab. Or 6-8 hours in biology; 6-8 hours in anatomy and physiology; 6-8 hours in chemistry; one nutrition course; one exercise physiology course (recommended but not required). 1. Graduate from a Didactic Program in Dietetics and have the verification statement or complete a Certificate Program in Nutrition. Graduate business and/or psychology program tuition applies if the student takes these courses. Graduate assistant positions are available throughout the university. Not all positions are available every year, so contact the individuals listed below to determine availability and eligibility. Long-tenured Lipscomb faculty member in nutrition, extremely well-connected throughout the region in all things nutrition and dietetics. 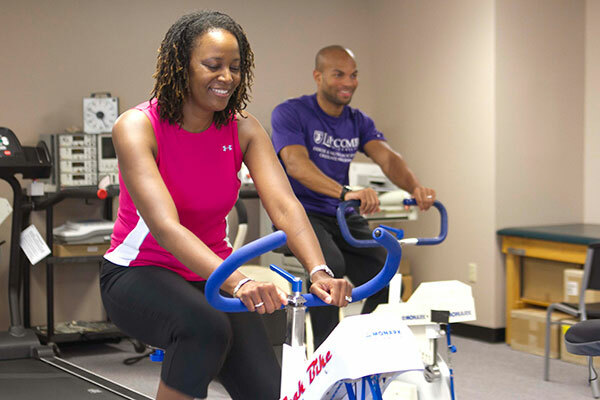 Cofounder of EXNS program Long-tenured Lipscomb faculty member in exercise physiology, leads the cardiovascular laboratory, and is a fellow in the ACSM. Long-tenured Lipscomb faculty member in exercise science, she teaches the statistics and research courses. Professional expertise in sport, exercise and performance psychology. These specialists conduct sport-specific testing sessions, design and implement safe and effective strength training and conditioning programs and provide guidance regarding nutrition and injury prevention based on scientific knowledge. Wellness and Health coaches utilize evidence-based conversation, clinical interventions and strategies to empower client/patients to make healthy behavioral changes. Nutritionists are experts in the use of food and nutrition to promote health and manage disease. They advise people on what to eat in order to lead a healthy lifestyle or achieve a specific health-related goal.